It’s been at least six months since an institution posed the modest question, what is the future of photography? so here is the latest manifestation of that discourse. During Unseen 2012, the Friday afternoon panel discussion ‘Future of Photography’ examined ‘what’s next’ in the contemporary photography landscape. Panel discussions members included Marc Feustel (Eyecurious blog), Simon Baker (Curator of Photography and International Art, Tate), James Reid (Director of Photography at Wallpaper), Christine Ollier (Artistic Director of Galerie les Filles du Calvaire), Francois Hébel (Director of Les Rencontres d’Arles Festival). The discussion was moderated by Marcel Feil, Artistic Director of FOAM. In all seriousness, it’s a highly engaging and enjoyable video, particularly the section that flags up work from the new generation of photographic artists who are making waves (think Dru Donovan, Asger Carlsen, Letha Wilson, Akiko Takizawa to name but a few) and serves to highlight the many and various directions in which the medium is headed. If you want to read a summary of the issues that came to the fore before watching click here. This entry was posted in 1000 Words Photography Magazine Blog, Contemporary Photography and tagged Afternoon Panel, Akiko, Arles, Artistic Director, Carlsen, Christine Ollier, Contemporary Photography, Director Of Photography, Dru, Friday Afternoon, International Art, Landscape Panel, Letha, Panel Discussion, Panel Discussions, Photographer, Photographers, Photographic Artists, Photographs, Photography Landscape, Photography., Seriousness, Simon Baker, Takizawa on October 24, 2012 by Tim Clark. If you are not familiar with the FotoVisura empire, now is a good time to explore the many options and opportunities they provide for photographers around the globe. FotoVisura is an organization that provides consultations, workshops, grants, and produces one of the most stellar on-line publications in the photo world, Visura Magazine. Their newest offering is a 4 day photography event set in San Juan, Puerto Rico. Lodge (2012) in Stowe, Vermont. Director and Head Curator Marianne Ramírez Aponte (SOLD OUT). This entry was posted in Contemporary Photography, L E N S C R A T C H, Uncategorized and tagged 30th September, Contemporary Photography, Delta Airlines, Director Of Photography, El Nuevo Dia, Fv, Guest Curator, International Institutions, Line Publications, Local Photography, Panel Discussions, Photo Editing, Photo World, Photographer, Photographers, Photographs, Photography., Puerto Rico Hotel, San Juan Puerto Rico, Sheraton Hotel, Stowe Vermont, Summer Sessions, Vibra, Viso on August 5, 2012 by Aline - lenscratch.blogspot.com/. Group, as well as many other local and international institutions. We welcome you to join us, and truly hope to see you in Puerto Rico! 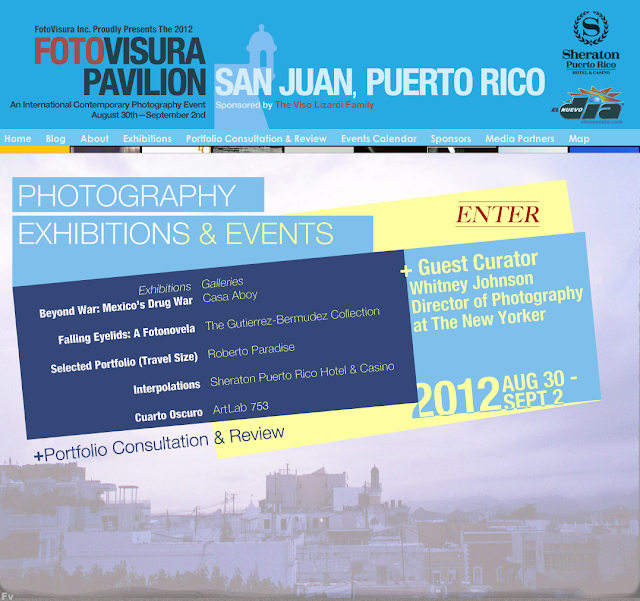 As part of the 2012 FotoVisura Pavilion, FotoVisura Inc.
San Juan, Puerto Rico on Saturday, September 1, 2012.
one-on-one sessions with each of the participating editors. with a variety of perspective and approaches from leading professionals. 8:00-9:00am: Deborah Dragon, Deputy Editor for Rolling Stone Magazine will give a talk at St. John’s High School about being a Photo Editor. 2:00-4:00pm: Walkthrough Tour at Museo de las Américas of the Bienal de Fotografía de Puerto Rico with The Puerto Rico Museum of Contemporary Art Curator Lilliana Ramos and Executive Director and Head Curator Marianne Ramírez Aponte (SOLD OUT). This entry was posted in Contemporary Photography, L E N S C R A T C H and tagged 30th September, Contemporary Photography, Director Of Photography, El Nuevo Dia, Fv, Guest Curator, International Institutions, Line Publications, Local Photography, Panel Discussions, Photo Editing, Photo World, Photographer, Photographers, Photographs, Photography., Puerto Rico Hotel, San Juan Puerto Rico, Sheraton Casino, Sheraton Hotel, Stowe Vermont, Summer Sessions, Vibra, Viso on August 5, 2012 by Aline - lenscratch.blogspot.com/. Canadian photographer Jessica Eaton uses her camera to create color invisible to the naked eye. She gives bright hues to gray forms in her series Cubes for Albers and LeWitt, and that work was recently awarded the photography prize at the 2012 Hyères International Festival of Fashion and Photography—a prize for which TIME’s director of photography Kira Pollack sat on the jury. Jessica Eaton is a Canadian photographer. Her work will be presented in a solo show at next year’s Hyères festival. See more of her work here or here. This entry was posted in Contemporary Photography, Uncategorized and tagged Abstract, Additive Color, art, Bright Hues, Byproducts, Canadian Photographer, color, Color Separation, Contemporary Photography, Director Of Photography, Eaton, Element Of Surprise, Example Spectrum, Filter Samples, Hyères, Jessica Eaton, Lewitt, Multiple Exposures, Naked Eye, Photographer, Photographers, Photographs, Photography Prize, Photography., Pigment Colors, Pollack, Primary Colors, Process, Profile, Series Samples, Three Colors, Two Colors on May 16, 2012 by Lily Rothman.